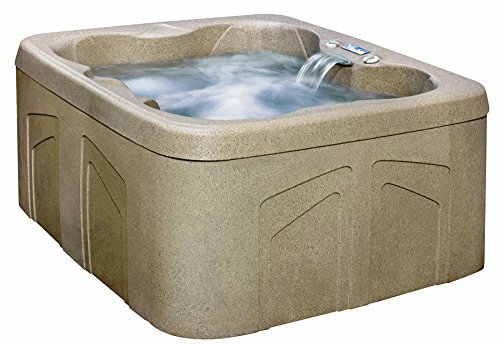 The Lifesmart Simplicity Plug and Play 4-person spa has the same standard parts and features as any brand name hot tub, such as Balboa topside controls, adjustable jets, and a top-loading filter, but also features a highly indestructible RockSolid Shell. The Discovery Simplicity is a 110 volt Plug & Play spa. This feature avoids the high cost of hot tub installation. Simply set it up, fill it up and plug it in. Only Lifesmart uses Eco Smart technology, the highly efficient energy management system built into every Lifesmart Simplicity spa. Lifesmart Spas require less energy and deliver better performance due to a full-foam insulation system and a thick energy-saving spa cover designed to save money on the operation of the spa. It even meets the strict California Energy Mandate for spas and hot tubs. The Lifesmart Simplicity Spa has 4 deep bucket seats complete with rotating back jets, a waterfall, and top-side comfort valves that allow you to find the perfect mix of air and water for the perfect massage. The Simplicity also features a top side digital command center and a spa light with interchangeable mood lens caps. The Simplicity features a barrier-free open seating design for up to 4 adults.